On March 19, 2019, hundreds of ocean advocates gathered in Sacramento to discuss ocean and coastal issues with state decision-makers during Ocean Day California. In the evening, the Aquarium hosted its tenth annual awards reception for about 200 state officials and legislators, their staff and ocean leaders from across the state. Guests enjoy the spread by Tataki Sushi & Sake Bar, featuring Seafood Watch Best Choice fish and vegan sushi. Aquarium Executive Director Julie Packard presented four state legislators with our 2019 Ocean Champion Awards, honoring their significant contributions to California’s ocean and coastal leadership. The award is part of the aquarium’s work to inspire and inform government decision-makers to take science-based action on behalf of the ocean. The Monterey Bay Aquarium isn’t alone in its drive to inspire conservation and host visitors sustainably. Thanks to steps by the Monterey County Convention & Visitors Bureau and others, the region is increasingly positioning itself as a leader in sustainable hospitality—and earning recognition for its commitment. 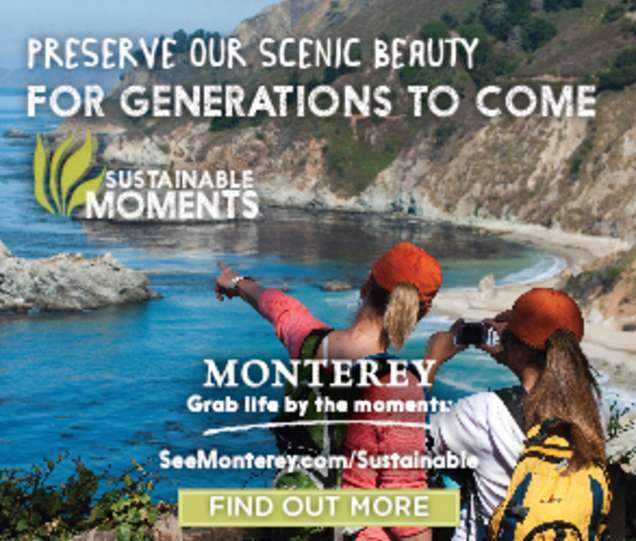 For visitors and local businesses, following sustainable practices has become a defining characteristic of Monterey County. Building on the area’s unique advantages, like having the Monterey Bay National Marine Sanctuary in its backyard, the Aquarium is leveraging results far beyond its doors, says Public Affairs Director Barbara Meister. “The Aquarium is well-known and recognized, so to the extent that we can help with messaging or bring other partners along—whether hotels that are reducing plastic use or restaurants that are serving Seafood Watch-approved species—all that bodes well for our mission,” Barbara says. Local fisherman Jerry Wetle brings sustainably caught sablefish to area restaurants by working with the Monterey Bay Fisheries Trust. The multifaceted push marks the latest chapter in the area’s long history of working to protect its environmental assets, she says. 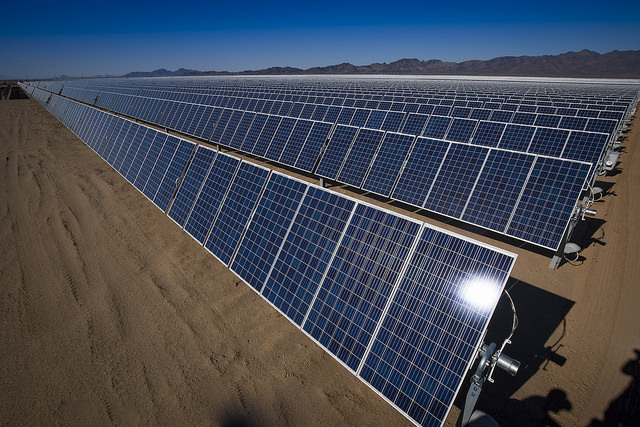 In recent years, communities around Monterey Bay have opted to draw only renewable energy from the electric power grid, to reduce greenhouse gas emissions. 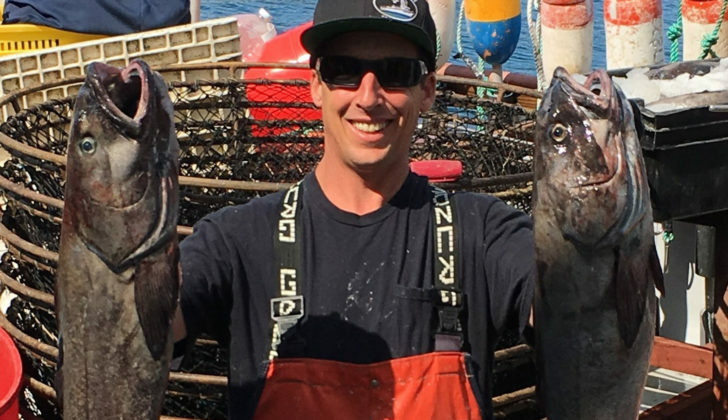 The Monterey Bay Fisheries Trust is helping fishing crews connect with regional restaurants to serve locally caught seafood. With that in mind, Chef Matt and his team have designed a sumptuous—and almost entirely plant-based—menu to show just how delicious climate-friendly meals can be. Executive Chef Matt Beaudin gets creative with a seasonal, plant-based menu. In developing the latest seasonal menu for the Aquarium Restaurant, Chef Matt wanted to both lower the carbon footprint of each dish, and to delight customers’ taste buds with new and enticing flavors. “This menu takes forgotten ingredients and makes them the star of the show,” says Chef Matt, who sources a significant portion of the Aquarium’s food from Evergreen Acres farm in nearby San Benito County. For the Aquarium, this winter menu is all about providing people with an opportunity to try something new—and to embrace the power we hold when deciding what to eat. Monterey Bay Aquarium Executive Director Julie Packard introduces the ocean plenary at the Global Climate Action Summit in San Francisco. Many of us may be feeling discouraged by recent scientific reports about the pace and impact of global climate change. In a video posted on the Aquarium’s website and social media channels, Aquarium Executive Director Julie Packard is calling on concerned Americans to step up and get involved. Her message comes as world leaders gather in Poland for COP 24 climate talks, and as new scientific reports confirm the steep toll that climate change is already taking on human lives. Those reports include the National Climate Assessment from the U.S. government, a similar assessment from the State of California, and the just-released United Nations’ Emission Gap Report for 2018. The latest polling shows a majority of Americans agree with the scientific consensus about climate change—and are ready to take courageous action. Learn more about the ocean impacts of climate change, and what you can do to make a difference. The 2018 California legislative session brought great news for the ocean! The Aquarium supported seven bills and two resolutions this year—and they all became state law. It’s not easy to find good news when talking about climate change. The latest scientific report from the Intergovernmental Panel on Climate Change spells out in no uncertain terms the magnitude of the challenges we face—and the urgency of action. 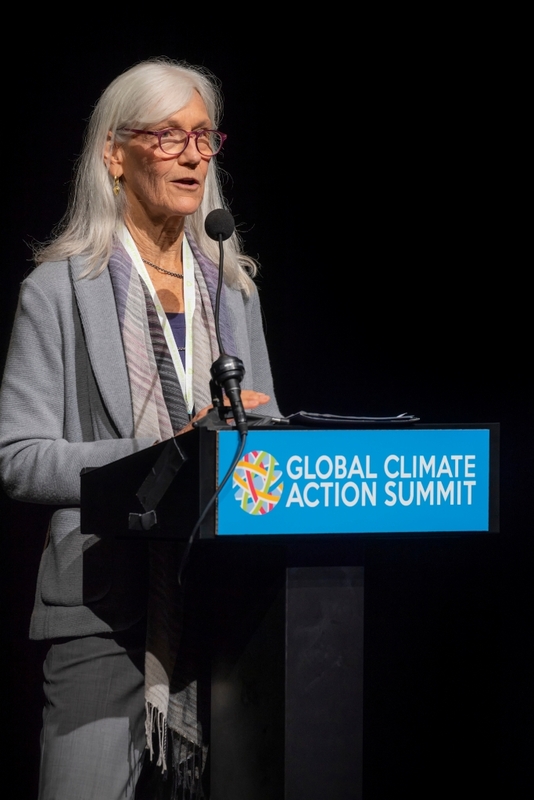 Executive Director Julie Packard welcomed delegates to the ocean plenary at the Global Climate Action Summit. It’s true that global scale climate trends continue to be daunting. But the pace of solutions is accelerating. So, in that way I’m among the optimists (along with the newest Nobel laureate in economics). As a global society, we know we must do to get on a sustainable course. We’re making progress faster than ever, and we have more tools to do the job. Many of these tools were created in Silicon Valley, and in other hubs of innovation around the world, from Redmond, Washington to Mumbai, India. Last month, I left the Global Climate Action Summit in San Francisco feeling energized. Monterey Bay Aquarium played a key role in putting the ocean on the Summit agenda, and it was clear people finally recognize that a healthy ocean is critical to avoiding catastrophic climate change. The question now is: Do we have the will to make it happen? The week of Septemer 10, people from around the world gathered in San Francisco for the Global Climate Action Summit. Convened by the State of California, the Summit brought together leaders—representing nations, states, cities, companies, investors and citizens—to celebrate climate action, and step up their ambitions to meet the targets set by the Paris Agreement. Monterey Bay Aquarium took part in the Summit to call for protection of the ocean, our most powerful tool to mitigate, and adapt to the impacts of, climate change. But what about the everyday work for climate solutions—the conversations we have with our families, neighbors, friends and colleagues? Aquarium Conservation Interpreter Allison Arteaga shares tips on how to make your next climate conversation a productive one. The Aquarium’s mission is to inspire conservation of the ocean. Each of us has a role to play through our everyday conversations. At the Monterey Bay Aquarium, a mother and her teenage son encounter an abalone at a touch pool. They’ll learn how they can help give shell-building animals like this one the stable ocean chemistry they need to support entire marine food webs. A retired couple watching a green turtle glide through the water at the Open Sea will discover what they can do to protect the next generation of sea turtles, which need stable beach temperatures to nest successfully. And a group of young adults mesmerized by the swaying of a kelp forest will be inspired by the ways in which, like the kelp itself, local communities are now getting their energy from the sun in order to protect the ocean. Conversations like these have power. At the Aquarium, we believe talking about climate change is an important part of the solution. That’s why we’ve been working for more than a decade on effective strategies to engage the public, particularly our 2 million annual visitors, in conversations about climate science and solutions.